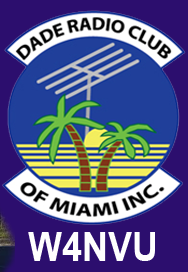 May 2014 – W4NVU – Dade Radio Club of Miami Inc.
Meeting was called to order at 19:30 with 34 present. We have a quorum. Julio presided over the meeting and welcomed everyone. The meeting was not broadcast live on the air tonight from the EOC. There was testing being conducted in another room tonight. Everyone took turns and stated their name and call sign and what they did that was Ham related since the last meeting. Julio welcomed everyone again and that we have a guest speaker tonight. Steve will speak to us about ISS Contact Antennas. Julio reminded everyone present tonight to sign in. The minutes for last month were posted on the website. Julio asked if there were any objections to the minutes as posted on the website. There were none. Miguel made a motion to accept the minutes, seconded by Brandon. The minutes are accepted as posted. Treasurer – Brianna advised that she is collecting dues for 2014. Please see Brianna to pay your dues. Brianna is taking $5.00 per ticket tonight for a raffle of a Baofeng radio. Website – Julio advised that it has been updated. He is uploading historical photographs of Ham radio. Club Elmer/PIO – Miguel advised that he sent out letters requesting donations from vendors for our Hambulance. So far, he has received no responses. Dave is in the other room testing. Lloyd is the new chair for Hamfest. He is working on obtaining a new site. He met with the chief of the Miccosukee tribe regarding a location on their premises. He is working on pricing with them and should have something by the end of next week. The space is for 28,000 feet. Miguel spoke about the Hambulance communication vehicle. It is a Julio’s house. He just got new keys made. Merritt also spoke about the repairs that he is making. Ray suggested having a Red Cross radio. We need a portable air conditioner and other equipment. Miguel will put together a list and re-post it. Julio showed the members where the “donate” button is on the website. Steve spoke about Field Day. Field Day will be June 28 and 29th. We will be joining the Everglades Club, Coral Gables Ares Races at JohnD.CampbellAgriculturalCenter at 18710 SW 288 Street in Homestead, FL33030 again this year for Field Day. Steve Taylor spoke to the members. We have received a 1 by 1 call sign of W4B for the event. Bring your equipment, antennas, and tents. We have a shelter if it rains. We will have food like last year, but bring snacks in case you get hungry. Setting up on Friday from 5 PM – 9 PM. Saturday the event starts at 12:00 Noon. Go the ARRL website and look up the rules and regulations for what you can do and can’t do. The 147.000 – Jason advised that it is being worked on. The 147.760 – Ray advised that it is being used for nets and doing well. The 224.200 – Julio advised that it is still at his house. The antenna is up at Miami High. The 444.200 – Merritt advised he is changing the time to military time and some other announcements. The Digipeater – 144.390 – Miguel advised that it works when it feels like it. D-Star – Miguel advised it is up and running. Dave came out of the testing room and announced that we have 3 new Techs tonight. Terry Pittser, Robert Huddleston and Robert Wilkinson. Congratulations to everyone! Emergency Committee – Miguel announced that all nets are listed on the website. Any changes or announcements will also be posted. He was asked by the EOC to have a Ham CERT Team. It would be a Tuesday, Thursday and Saturday. If interested, email Miguel at kj4yvn@gmail.com. If you are interested in being a Races member, the application is online. Fill it out and give it either to Miguel or Carl. If you already have an ID, you are already approved. Races meetings will now take place 4 times a year. They will be held right before the DRC meeting at 6:30 PM – 7:00 PM. The next meeting will be on June 9th. To join South Florida Hams go to the website soflahams.com. Julio reminded everyone to start checking your batteries and get them charged. Check your equipment and get ready. Hurricane season is in a few weeks. Ray advised that there is a checklist at Hurricanechecklist.com. Miguel said all of us should have a “go” bag ready. Lloyd suggested that we have a new position for the club – Historian. With Julio posting photographs of the history of South Florida FM and Dade Radio Club, this person can research old photographs and they will be uploaded into a separate section on our website. Miguel made a motion to create the position of Historian, seconded by Hollis. A vote was taken and the motion passed. We will take nomination and vote on a person at the next meeting. Steve then gave his ISS Contact Antenna Demonstration and presentation. WX2IMG software is free. He explained how to contact various satellites that are moving 17,500 mph. These satellites are smaller than a shoe box. He showed us photographs from the NOAA satellite. U-Tube has many videos online. Great presentation! Julio asked if there was any other new business. There was none. The raffle for the Baofeng radio was won by our new Tech Richard Zaveleta. Since he won the last time, he donated it back. Dave Gleinn then won the radio. Congratulations! Miguel made a motion to adjourn, seconded by Brianna. The DRC meeting was adjourned at 20:28.